As soon as the meal is served, I start with a brief, routine prayer that goes something like, "Thank You, Lord, for this food. Bless this for my body's nourishment. Amen." Then I dig into my food. Many times, these prayers aren't heartfelt. I'm not really thankful to God for putting food on my table. It's all routine—a ritual devoid of meaning. And yet the Lord always provides. He is always faithful. My ungratefulness doesn't hinder Him from giving me what I need. I'm stunned just thinking how each and every time, I always find the money to feed myself. Sometimes I eat in restaurants. Many times, I order fast food or takeouts. Or, in exceptional circumstances, I cook my own meals. If I'm short on funds, there will always be people who will treat me to a sumptuous lunch or a hearty dinner. Or sometimes, I'd find a snack I had stored somewhere. The fact that I eat three times a day, with a couple of snacks in between, is a testament of God's goodness. Didn't the Lord Jesus Christ instruct His disciples to pray, "Give us this day our daily bread . . ." (Matthew 6:9-13)? I think that Jesus said so because He wanted to remind us that God is not indifferent to our needs; He is actively involved in providing for us. May His name be praised as we eat today. The chicken at Chicken Charlie, along Adriatico Street, is nothing exceptional, but we sometimes go here for lunch. Nicoise Salad at Almon Marina. Goes well with blue cheese. Banoffee Pie at Banapple along Timog Avenue. My brother, still happily unemployed, treated me for lunch after church service. Anything with cheese is jebarrific for the semi-lactose-intolerant like myself. (Aplogies to non-Tagalog speakers: humor is untranslatable). My room-/classmate Bryan Jay took me to Chick Boy along UN Avenue for dinner. 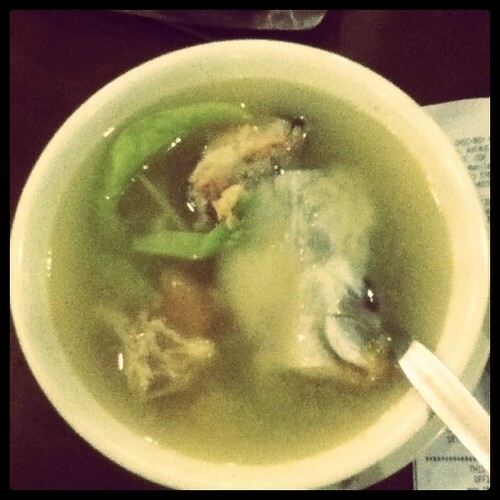 This stew—tinolang ulo ng isda—tastes like meals cooked at home. At sulit pa: Php 48! 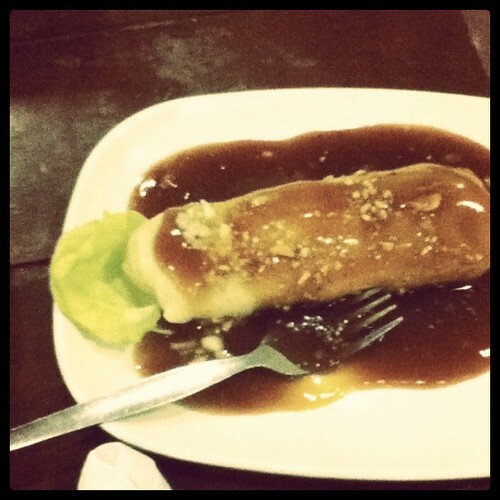 Lumpiang sariwa (fresh lumpia) for Php 40. Argh, Kuya Lance. Bigla akong nag-crave ng banoffee pie dahil dito. Anyway, I'm also guilty of rushed, routine prayers pre-meal, even none at all. Sometimes I have to be unwittingly reminded by someone I eat with who pauses to pray. I'm usually rebuked by this verse from 1 Corinthians: "So whether you eat or drink or whatever you do, do it all for the glory of God." The faithfulness with which God provides our meals might cause us to take them - and His provision - for granted, but I believe that He is glorified when we take the time to thank Him earnestly for them. 1 Corinthians 10:31 nga! Thanks for sharing, Abby!